With updates in 2001, this article outlines the story of the widespread resistance and near-mutiny within the US Army, Navy and Air Force during the Vietnam War. This resistance was a major factor in the eventual withdrawal of US troops. While we in libcom disagree with some of the author's conclusions, the article contains very interesting historical information. For a more detailed account of the resistance, we recommend our article GI Resistance in the Vietnam War, 1961-1973 on our libcom.org people's history section. A friend who was in the U.S. military during the 1990-91 Persian Gulf War told me that before President G.H.W. Bush visited the troops in Saudi Arabia, enlisted men and women who would be in Bush's immediate vicinity had their rifle and pistol ammunition taken away from them. This was supposedly done to avoid "accidents. " But it was also clear to people on the scene that Bush and his corporate handlers were somewhat afraid of the enlisted people who Bush would soon be killing in his unsuccessful re-election campaign. The suppressed history of the last big U.S. war before 'Operation Desert Storm' shows that the Commander-in-Chief had good reason to fear and distrust his troops. Our rulers want us to forget what happened during the Vietnam war - especially what happened inside the U.S. armed forces during the war. Our rulers remember it all too well. They want us to forget what defeated their war effort, and the importance of resistance to the war by enlisted men and women. Until 1968 the desertion rate for U.S. troops in Vietnam was lower than in previous wars. But by 1969 the desertion rate had increased fourfold. This wasn't limited to Southeast Asia; desertion rates among G.I. 's were on the increase worldwide. For soldiers in the combat zone, insubordination became an important part of avoiding horrible injury or death. As early as mid-1969, an entire company of the 196th Light Infantry Brigade sat down on the battlefield. Later that year, a rifle company from the famed 1st Air Cavalry Division flatly refused - on CBS TV - to advance down a dangerous trail. In the following 12 months the 1st Air Cav. notched up 35 combat refusals. From mild forms of political protest and disobedience of war orders, the resistance among the ground troops grew into a massive and widespread "quasi-mutiny" by 1970 and 1971. Soldiers went on "search and avoid" missions, intentionally skirting clashes with the Vietnamese, and often holding three-day-long pot parties instead of fighting. "Frag incidents" or "fragging" was soldier slang in Vietnam for the killing of strict, unpopular and aggressive officers and NCO's. The word apparently originated from enlisted men using fragmentation grenades to off commanders. Heinl wrote, "Bounties, raised by common subscription in amounts running anywhere from $50 to $1,000, have been widely reported put on the heads of leaders who the privates and SP4s want to rub out. "Shortly after the costly assault on Hamburger Hill in mid-1969, the GI underground newspaper in Vietnam, GI Says, publicly offered a $10,000 bounty on Lieutenant Colonel Weldon Hunnicutt, the officer who ordered and led the attack. "The Pentagon has now disclosed that fraggings in 1970 (209 killings) have more than doubled those of the previous year (96 killings). Word of the deaths of officers will bring cheers at troop movies or in bivouacs of certain units. " Congressional hearings on fraggings held in 1973 estimated that roughly 3% of officer and non-com deaths in Vietnam between 1961 and 1972 were a result of fraggings. But these figures were only for killings committed with grenades, and didn't include officer deaths from automatic weapons fire, handguns and knifings. The Army's Judge Advocate General's Corps estimated that only 10% of fragging attempts resulted in anyone going to trial. In the America l Division, plagued by poor morale, fraggings during 1971 were estimated to be running around one a week. War equipment was frequently sabotaged and destroyed. By 1972 roughly 300 anti-war and anti-military newspapers, with names like Harass the Brass, All Hands Abandon Ship and Star Spangled Bummer had been put out by enlisted people. "In Vietnam," wrote the Ft. Lewis-McCord Free Press, "The Lifers, the Brass, are the true enemy..." Riots and anti-war demonstrations took place on bases in Asia, Europe and in the United States. By the early 1970s the government had to begin pulling out of the ground war and switching to an "air war," in part because many of the ground troops who were supposed to do the fighting were hamstringing the world's mightiest military force by their sabotage and resistance. With the shifting over to an "air war" strategy, the Navy became an important centre of resistance to the war. In response to the racism that prevailed inside the Navy, black and white sailors occasionally rebelled together. The most significant of these rebellions took place on board the USS Constellation off Southern California, in November 1972. In response to a threat of less-than-honourable discharges against several black sailors, a group of over 100 black and white sailors staged a day-and-a-half long sit-in. Fearful of losing control of his ship at sea to full-scale mutiny, the ship's commander brought the Constellation back to San Diego. One hundred thirty-two sailors were allowed to go ashore. They refused orders to reboard the ship several days later, staging a defiant dockside strike on the morning of November 9. In spite of the seriousness of the rebellion, not one of the sailors involved was arrested. Sabotage was an extremely useful tactic. On May 26, 1970, the USS Anderson was preparing to steam from San Diego to Vietnam. But someone had dropped nuts, bolts and chains down the main gear shaft. A major breakdown occurred, resulting in thousands of dollars worth of damage and a delay of several weeks. Several sailors were charged, but because of a lack of evidence the case was dismissed. With the escalation of naval involvement in the war the level of sabotage grew. In July of 1972, within the space of three weeks, two of the Navy's aircraft carriers were put out of commission by sabotage. On July 10, a massive fire swept through the admiral's quarters and radar centre of the USS Forestall, causing over $7 million in damage. This delayed the ship's deployment for over two months. In late July, the USS Ranger was docked at Alameda, California. Just days before the ship's scheduled departure for Vietnam, a paint-scraper and two 12-inch bolts were inserted into the number-four-engine reduction gears causing nearly $1 million in damage and forcing a three-and-a-half month delay in operations for extensive repairs. The sailor charged in the case was acquitted. In other cases, sailors tossed equipment over the sides of ships while at sea. The House Armed Services Committee summed up the crisis of rebellion in the Navy: "The U.S. Navy is now confronted with pressures...which, if not controlled, will surely destroy its enviable tradition of discipline. Recent instances of sabotage, riot, wilful disobedience of orders, and contempt for authority...are clear-cut symptoms of a dangerous deterioration of discipline. " The rebellion in the ranks didn't emerge simply in response to battlefield conditions. A civilian anti-war movement in the U.S. had emerged on the coat tails of the civil rights movement, at a time when the pacifism-at-any-price tactics of civil rights leaders had reached their effective limit, and were being questioned by a younger, combative generation. Working class blacks and Latinos served in combat units out of all proportion to their numbers in American society, and major urban riots in Watts, Detroit and Newark had an explosive effect on the consciousness of these men. After the assassination of Martin Luther King Jr. major riots erupted in 181 U.S. cities; at that point the rulers of the United States were facing the gravest national crisis since the Civil War. And the radical movement of the late 1960's wasn't limited to the United States. Large-scale rebellion was breaking out all over the world, in Latin American and Europe and Africa, and even against the Maoists in China; its high point was the wildcat general strike that shut down France in May, 1968, the last time a major industrialised democracy came close to social revolution. The crisis that racked American society during the Vietnam war was a grave development in the life of what had been a very stable and conservative society, but it wasn't profound enough to create an irreparable rupture between the rulers and the ruled. In the early 1970's, the U.S. was still coasting on the relative prosperity of the post-World War Two economic boom. Social conditions faced by working people in the U.S. weren't anywhere near as overwhelming and unbearable as they are now. U.S. involvement in a protracted ground war in Iraq today or Columbia tomorrow could have a much more rapid explosive impact on American society. A number of years ago, in a deceitful article in Mother Jones magazine, corporate liberal historian Todd Gitlin claimed that the peaceful and legal aspects of the 1960's U.S. anti-war movement had been the most successful opposition to a war in history. Gitlin was dead wrong; as a bourgeois historian, Gitlin is paid to render service unto capital by getting it wrong, and get it wrong he does, again and again. The most effective "anti-war" movement in history was at the end of World War One, when proletarian revolutions broke out in Russia, Germany and throughout Central Europe in 1917 and 1918. A crucial factor in the revolutionary movement of that time was the collapse of the armies and navies of Russian and Germany in full-scale armed mutiny. After several years of war and millions of casualties the soldiers and sailors of opposing nations began to fraternise with each other, turned their guns against their commanding officers and went home to fight against the ruling classes that had sent them off to war. The war ended with a global cycle of mutinies mirroring the social unrest spreading across the capitalist world; some of the most powerful regimes on Earth were quickly toppled and destroyed. Soldiers and sailors played a leading role in the revolutionary movement. The naval bases Kronstadt in Russia and Kiel and Wilhelmshaven in Germany became important centres of revolutionary self-organisation and action, and the passing of vast numbers of armed soldiers and sailors to the side of the Soviets allowed the working class to briefly take power in Russia. The French invasion of Revolutionary Russia in 1919 and 1920 was crippled by the mutiny of the French fleet in the Black Sea, centred around the battleships France and the Jean Bart. Mutinies broke out among sailors in the British Navy and in the armies of the British Empire in Asia, and even among American troops sent to aid the counter-revolutionary White Army in the Russian Civil War. Revolutionary unrest doesn't happen every day, but when it does break out, it can overcome the most powerful states with a surprising and improbable speed, and the collapse of the repressive forces of the state is a key moment in the beginning of a new way of life. It's an ugly fact that war and revolution were intimately linked in the most far-going social movements of the 20th century. With the U.S. governments' self-appointed role as the cop for global capitalist law and order, it's likely that the crisis that will cause an irreparable break between the rulers and the ruled in the United States will be the result of an unsuccessful war. That day may soon be upon us. At that point, widespread fraternisation between anti-capitalist radicals and enlisted people will be crucial in expanding an anti-war movement into a larger opposition to the system of wage labour and commodity production that generates wars, exploitation, poverty, inequality and ecological devastation. An examination of what happened to the U.S. military during the Vietnam War can help us see the central role "the military question" is going to play in a revolutionary mass movement in the 21st century. It isn't a question of how a chaotic and rebellious civilian populace can out-gun the well-organised, disciplined armies of the capitalist state in pitched battle, but of how a mass movement can cripple the effective fighting capacity of the military from within, and bring about the collapse and dispersal of the state's armed forces. What set of circumstances can compel the inchoate discontentment endemic in any wartime army or navy to advance to the level of conscious, organised resistance? How fast and how deeply can a subversive consciousness spread among enlisted people? How can rebels in uniform take effective, large-scale action against the military machine? This effort will involve the sabotage and destruction of sophisticated military technologies, an irreversible breakdown in the chain-of-command, and a terminal demoralisation of the officer corps. 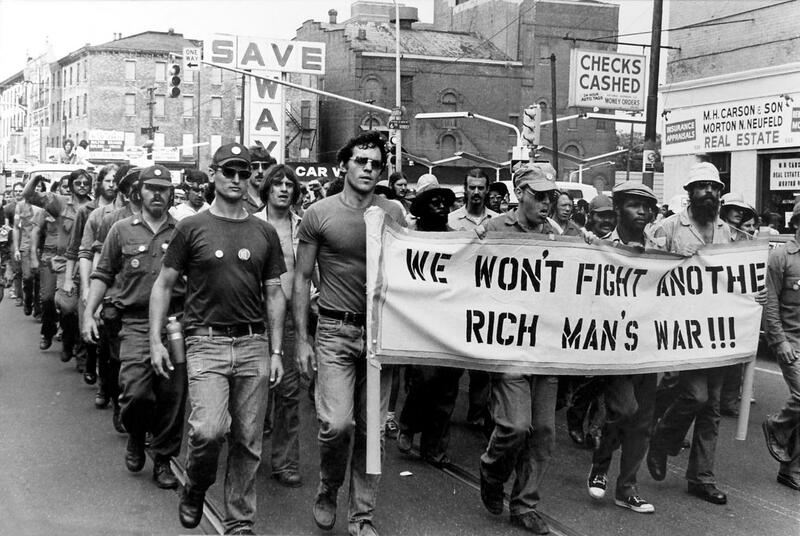 The "quasi-mutiny" that helped defeat the U.S. in Vietnam offers a significant precedent for the kind of subversive action working people will have to foment against 21st century global capitalism and its high-tech military machine. As rampaging market forces trash living conditions for the majority of the world's people, working class troops will do the fighting in counter-insurgency actions against other working class people. War games several years ago by the Marines in a defunct housing project in Oakland, California, dubbed 'Operation Urban Warrior,' highlight the fact that America's rulers want their military to be prepared to suppress the domestic fallout from their actions, and be ready to do it soon. But as previous waves of global unrest have shown, the forces that give rise to mass rebellion in one area of the globe will simultaneously give rise to rebellion in other parts of the world. The armed forces are vulnerable to social forces at work in the larger society that spawns them. Revolt in civilian society bleeds through the fabric of the military into the ranks of enlisted people. The relationship between officers and enlisted people mirrors the relationship between bosses and employees, and similar dynamics of class conflict emerge in the military and civilian versions of the workplace. The military is never a hermetically sealed organisation. Our rulers know all this. Our rulers know that they are vulnerable to mass resistance, and they know that their wealth and power can be collapsed from within by the working class women and men whom they depend on. We need to know it, too. Much of the information for this article has been taken from the book Soldiers in Revolt: The American Military Today, by David Cortright, published by Anchor/Doubleday in 1975. Readers should please send copies of this article to any enlisted people they know. INTERNATIONALISM IN PRACTICE: - An American soldier in a hospital explained how he was wounded: He said, "I was told that the way to tell a hostile Vietnamese from a friendly Vietnamese was to shout 'To hell with Ho Chi Minh!' If he shoots, he's unfriendly. So I saw this dude and yelled 'To hell with Ho Chi Minh!' and he yelled back, 'To hell with President Johnson!' We were shaking hands when a truck hit us. " (from 1,001 Ways to Beat the Draft, by Tuli Kupferburg). Colin Powell was a junior officer in the fragging-plagued America l Division during the Vietnam War. On numerous occassions, Powell has said that the US defeat in Vietnam was the main influence on the way he sees the world. Powell clearly understands that the armed forces are a function of the larger civilian society that spawns them. Was Colin Powell speaking about the US Army -- or about US society itself with his comment about seeing "this wonderful society destroyed"? You be the judge! Vietnam: The collapse of the armed forces- Marine Colonel Robert D. Heinl Jr.
hi- that photo u have, that i have on my wall, is of vets, not gi's (well maybe some too), from the important Vietnam Veterans Against the War (vvaw)- some gi's were vvaw too- yer article is like another "GI Resistance in the Vietnam War, 1961-1973" on libcom- both very good, i'm not sure why libcom has probs with yer artice- i only just skimmed it fast- powell was a punk (apologies to punks) in that i don't believe was in the field at all, an administrator, who blew off reports of obvious atrocities by gi's- THE film on gi resistence is 'Sir! No Sir!' - get it ya'll!